While OnePlus is busy teasing the upcoming OnePlus 3 smartphone, it looks like the first concrete set of hardware specs have surfaced online courtesy of famous leakster Evan Blass aka @evleaks. 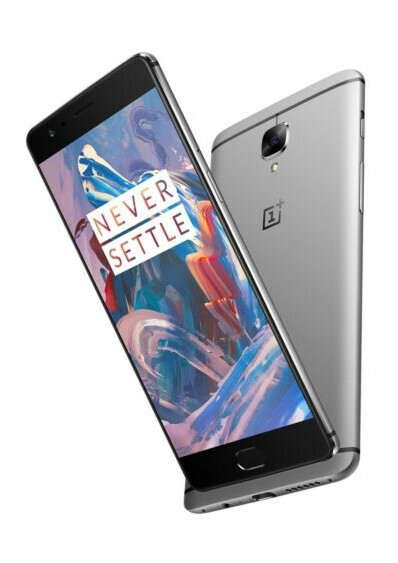 If these rumored OnePlus 3 specifications turn out to be accurate, then the OnePlus 3 could well become the most successful smartphone in the young company's portfolio. 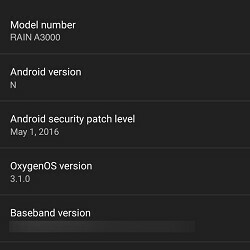 Earlier today, Blass shared a screenshot allegedly captured on a OnePlus 3 prototype running the Android N developer build. This hints at the fact that the OnePlus 3 will either launch with Android N on board or will be updated to the upcoming Android version soon after Google publishes the final code later this summer. Moving on to the OnePlus 3 hardware specs, Blass claims that the handset will come with all of the internal hardware that we've come to expect from a 2016 high-end smartphone. Included here are Qualcomm's Snapdragon 820, 64GB of onboard storage, and a 16MP primary camera. Blass also claims that the OnePlus 3 will include an NFC chip, unlike its direct predecessor, the OnePlus 2. Note that, earlier today, OnePlus CEO Pete Lau teased the upcoming smartphone's 8MP front-facing selfie shooter. Blass also puts further weight behind the notion that the OnePlus 3 will come with a 5.5-inch display running at 1080 by 1920 pixels. While all modern high-end smartphones come with QHD (1440 by 2560 pixels) displays, there is evidence to support that the extra display sharpness gained by making the jump to a QHD panel is offset by performance and battery life drawbacks. Given that OnePlus smartphones usually aim to provide a balance between cost and hardware, a 1080p display seems like an acceptable sacrifice. Previous rumors and leaks have suggested that the OnePlus 3 will ditch the plastic build of its predecessors in favor of a more premium metal build. The image that you can see above is an alleged leaked picture of a OnePlus 3 prototype. Note that a recent leak has suggested that there will be two versions of the OnePlus 3, one with 4GB of RAM and 32GB of onboard storage and one with a whopping 6GB of RAM and 64GB of storage. Like its predecessors, the OnePlus 3 is expected to be priced somewhere between $300 and $400, although nothing can be confirmed at this point. What do you guys think of this set of alleged OnePlus 3 specifications? Is anyone disappointed to learn that the phone might come with a 1080p display? 1080p on 5.5 inches is fine, panel matters. I'm disappointed that it has tiny 5.5" display. I was hopping that it will be as big as Xiaomi maX. BTW, am I too drunk or does it actually resembles Xiaomi mi5...? Anyone? You're too drunk. Front resembles Samsung / Meizu. The back htc / Huawei. The design for me is the current mainstream. It's alright. My concern would be the battery life. You can't use the Mi5 in Europe so hopefully this one will have all the necessary LTE bands. And yes, FHD is enough. Now perhaps also an IR-blaster and inductive charging, please. OMG 6gb Ram. Ip6s will be sold. To buy this. seems good so far .. what about battery ?? any leaks/rumor ?? Standard 2016 flagship. Nothing special, nothing too bad. As boring as the htc 10. It should be a boringly reliable phone, nothing more. I'm curious to see as to how well this stacks up against the upcoming note 6. Watch out its the flagship killer! No ir blaster? I guess g5 is my only option this year. 1080p is great. Give us sd card support and removable battery and it's a 10!